Whether genealogist, historian or curious onlooker, at some time these folks and most others ponder the beginnings of existence. For American genealogists, tracing their ancestry to an Ellis Island or even a Mayflower arrival is a victory. In terms of Department history and tracing our beginnings, well, we may have come away with victory, or we may well be struggling to achieve it. The logical starting point, at least as this story goes, was the fact that the first official Department consisted of six men. Not only is this historically accurate, but it was our belief that photographic documentation existed within the walls of the museum. In fact, the picture was, and is, the starting point of our guided tours. Six riflemen clad in heavy woolen long coats and sporting considerable facial hair are featured in the first photo on our tour. 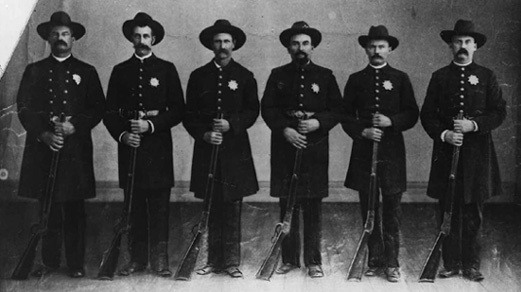 The brass plaque affixed to the frame reads, “LAPD First Paid Officers 1869.” This is, indeed, the year the Department started, and it is a photograph of six male officers wearing the first style of badge. Recent research has shown that these were in fact not our first six. Six early officers, yes, but the first six, no way. So after all of these years, why are we so sure? Early city records, as cited in Posses to Professionals, contains the listing of our earliest officers S. H. Bryant, Joseph Dye, Jose Redona, J. E. Reese, Robert Dobson and City Marshal William C. Warren. Nowhere in this listing is H. W. Marden, a telling omission that relates directly to our photo. 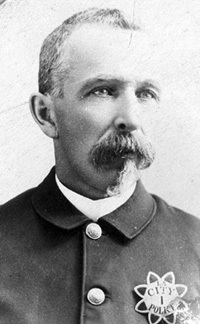 Patrolman Marden’s chin whiskers distinguish him from the others in the photograph. The facial hair of his companions is striking and substantial, but Marden has the only goatee. In our work with our photo archives, we came across Marden’s individual portrait from 1889. Marden wore badge number 21. And lucky 21 it turned out to be for us. As research continued we found another standing portrait of Marden. The portrait’s reverse dates the portrait to 1890. In each of the portraits, Marden is wearing badge number 21. Things deteriorate with age. Since what we try to do here is collect and display interesting material from the ages, we know up front that we will be dealing with the items that are dirty, dilapidated or in general disrepair. For the sake of preserving and presenting our history these are welcome challenges that often produce grand results. It is this kind of tremendous anticipation that we now enjoy after acquiring our newest artifact, a 1955 Chevrolet B Wagon. Through our friends with the San Diego Police Department Historical Society, we learned of the potential sale of this unique vehicle. After some preliminaries, we were able to acquire the vehicle from its owner, who graciously contributed a goodly portion of its fair market value. What it means for us is another long term vehicle restoration project. Something we are looking forward to as it should be a truly unique vehicle once restoration is completed. This of course won’t happen overnight, but once it is done, this will make a great display, fitting of show at someplace like, oh let’s say the Los Angeles County Fair. Through the generosity of the folks at Fairplex, and Lisa Girolami in particular, we will be exhibiting one or two of our vehicles at this year’s county fair. Fairplex has arranged for some complimentary exhibit space inside Exhibit Hall 4 for the entire run of the fair. This should be a wonderful opportunity to reach out to hundreds of thousands of fair visitors. Hopefully all of you who make it to the fair will stop by and check out our exhibit. For those who cannot make it to the fair, we present another opportunity to have some fun and support the historical society. The thirteenth annual Jack Webb Awards will be coming to the Sheraton Universal on September 9, 2006.
these stories are two great ones. For us, we are looking forward to our wonderful night out at the Jack Webb awards and hope you will attend. More information is available at www.LAPM.com or at the society offices at (323) 344-9445. Besides making all the preparations to ensure a great event, we have been busy again with the entertainment industry. A series of production companies for both film and television have made use of the museum for upcoming shows. The wide variety of work we do here, usually necessitates some assistance. This time around we owe thanks to Directors Dave Dalton, Art Sjoquist and Danny Staggs, along with Detective Adrian Soler. Officer Steve Whitelaw, West Valley Area, also willingly lent his assistance. Away from here, Foster Dennis of California Paving and Grading continues to be a great help to virtually anything we do here. The same can be said of the generous people at the Getty. We thank them all for frequently thinking of us and helping out in the most generous of ways. We may have, it’s just that this one is not it. Now whether we tamper with an aged brass plaque…doubtful. Will we change the way we lead our tours, maybe. Will we continue to pursue the identities of the remaining five in the photo, most assuredly. Seemingly, one of the next logical steps would be identifying our early badge holders. Fortunately, we have a great photograph of an officer wearing badge number one of our first series of badges. A 1926 newspaper article about the selection Chief James Davis identifies “Powerful” John Stephens as “the proud possessor of badge number one.” There are enough similarities that it may well be. John Stephens or not, we are content to know that our holdings include this wonderful picture of whoever once wore our very first badge.